Tamara Walton, M.P.A., M.H.A. joined the Translational Research Program as a Program Coordinator in 2008. Ms. Walton has worked with SPORE grantees to provide assistance on submission and management topics pertaining to their grant, such as clinical trial reporting, progress reporting, development program management and budgeting. 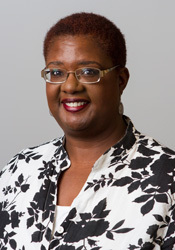 Ms. Walton also serves as the Genomic Data Administrator for the Division of Cancer Treatment and Diagnosis where she is responsible for assisting grantees with their genomic data submissions for dbGaP. Ms. Walton has over thirty years of experience in the business field and has held various positions including Administrative and Program Manager, Deputy Director of Administration, Sales and Marketing Director, and Human Resources Director for Benefits and Occupational Health. Ms. Walton received her double Master’s degree from Webster University and is currently working on her Doctor of Health Administration. Ms. Walton was recently awarded the NIH Director’s Award 2016.